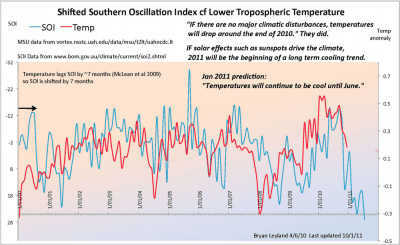 This remarkable forecast, now some eight months old, comes out of a 2009 paper showing a lagged correlation between global temperatures and the Southern Oscillation Index (SOI), calculated from fluctuations in the air pressure difference between Tahiti and Darwin, and indicative also of the start (and the state) of a La Nina (as now) or an El Nino. This correlation is a lot more convincing than comparing global temperature with CO2 levels! What is remarkable about this is that a retired engineer in New Zealand, armed only with Excel and the paper by McLean et al., was able to make this prediction and publish it on the Internet. Why did the “climate scientists” fail in this? 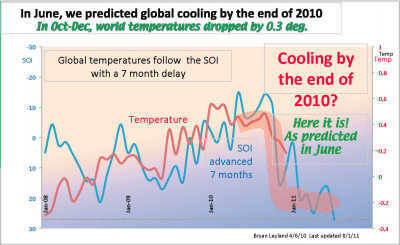 They said nothing about end-of-year cooling, predicting instead that 2010 would be the hottest year ever! It wasn’t, but it was only marginally cooler than 1998. 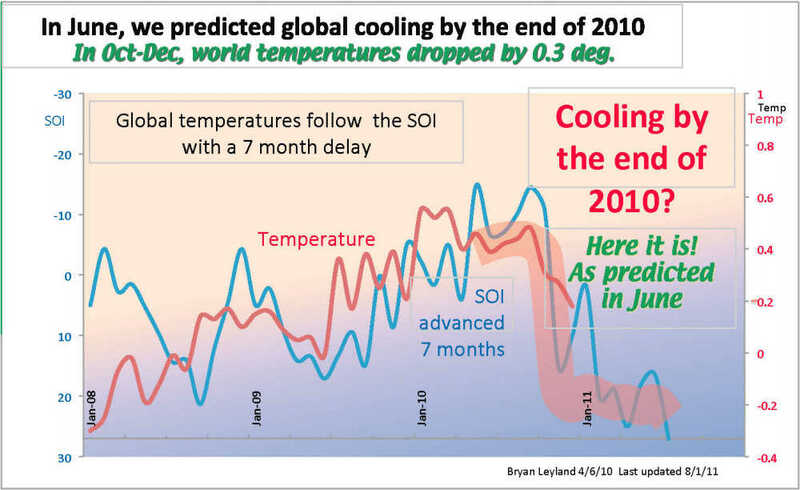 Bryan now makes another prediction: world temperatures will remain cool until June at least. Whether or not this is the beginning of long-term cooling induced by sunspots (or anything else) remains to be seen. But there is no doubt that the present La Nina is intense. According to the Australian BoM ENSO Wrap-Up web page, “The Southern Oscillation Index (SOI) value for December of +27 is the highest December SOI value on record, as well as being the highest value for any month since November 1973.” These seem to indicate we’re in for at least several months of cooling. Here’s a longer-term look at the astonishing lagged correlation between global temperature and the SOI. Why hasn’t anyone else noticed this? 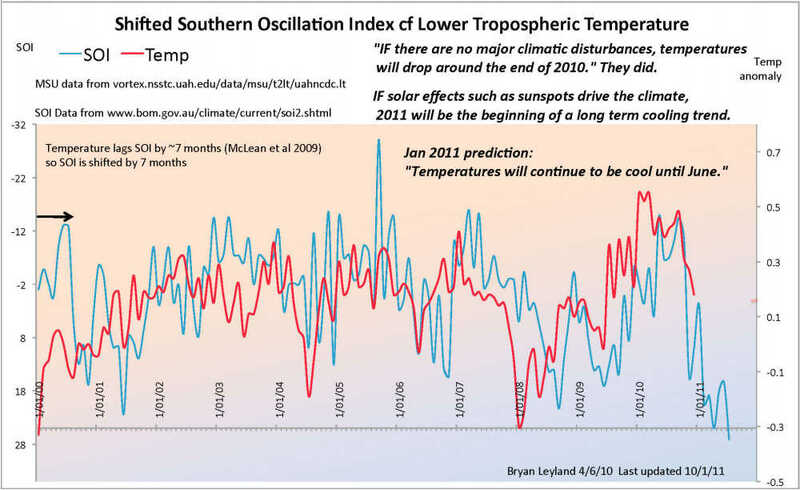 A longer view showing the remarkable correlation between global temperatures and the SOI. 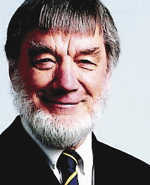 Click for larger version. Joanne Nova has an interesting post on this global temperature prediction. She also reminds us that the SOI trace is inverted, as well as being pushed seven months into the future. The current La Nina is predicted (by NOAA) to last through the SH winter. This means we can probably expect globally cooler conditions for almost a year, because of the lag. Note the Sarah Palin vernacular. In climate science, it is unknown to predict an outcome of a particular hypothesis and accept that its truth will stand or fall on whether the prediction turns out to be correct. Instead, climate scientists “project” future outcomes based on storylines which are improbable but which can’t be disproved by results until all contemporaries are dead. Goodness, Clarence, are you suggesting that some scientists might disregard this negation of the dangerous anthropogenic global warming theory? Now, just what the gosh-darn was that theory, anyways? This lower limit of instrumental uncertainty implies that Earth’s fever is indistinguishable from zero Celsius, at the 1σ level, across the entire 20th century.